Photo by Rick Cummings, RickPhoto.com. I remember being told I was lucky. I remember not feeling lucky. I remember feeling angry. The day I found out Cancer had taken up residence in my abdomen, on my cervix and in my plans, was a day I slipped into a withdrawal from life that was more secretive and numbing than I can almost stand to recall. Photo by Flickr User whatmegsaid. I told no one. I hid. I deleted voicemails from the doctor’s office imploring me to call, to make a plan, to take action of some sort towards saving my life. I sat withdrawn into the seat of myself, the space of routines, as if that Monday were the same as any other: classes, lab, errands, work, homework, housework, horses fed, and sleep. Tuesday, I woke up and made it the same. Two weeks passed, secrets intact. No doctor’s calls were returned. I oddly felt that if I perhaps refused it all, refused it as real, it would dissolve itself into the power of my plans. One night, while cleaning the barn and massaging all the many needs of the horses to be put up for the night, the phone rang. I closed Daisy’s stall door behind me and stepped through the dim light to the dusty barn phone. I was stunned into an awkward silence. 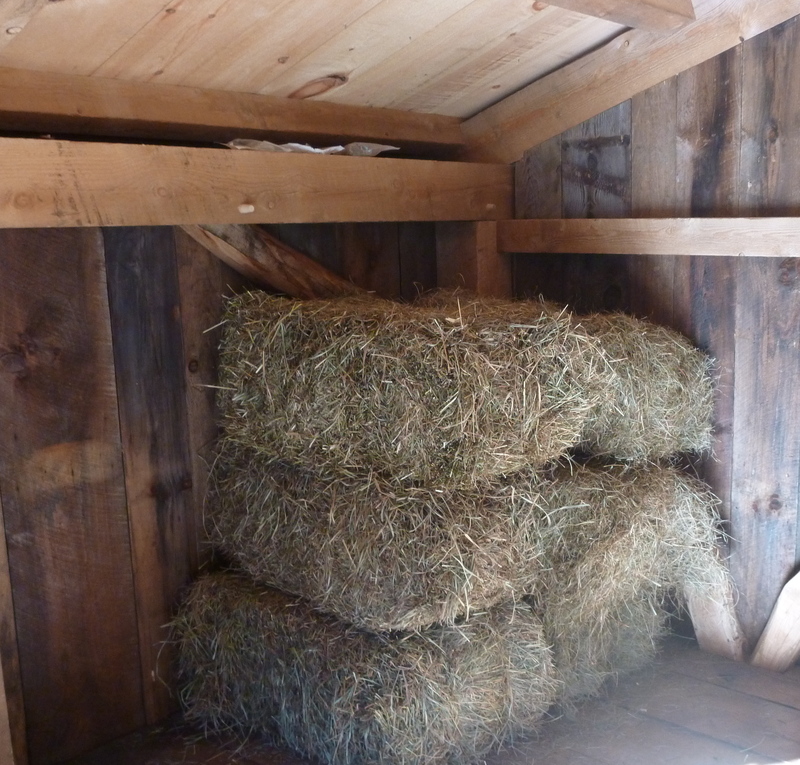 The once familiar, comforting smells of the barn, the hay, the grain, the musky horse scent itself, all started to assault my senses to the point of nausea. The word “died” pierced the bubble of my secrecy and suddenly the word “Cancer” stepped from the bubble into the real and demanded my attention like a screaming child. I felt the embodiment of fear and at that moment knew I needed my mommy. Mom called me back from the long pause, which to her must have been insanely awkward and terrifying. My mom fell silent. No gasp. No tears. She simply fell into my silence that held those words finally spoken. I have no idea how long we sat there, hundreds of miles apart. I was not alone in the barn that evening. In the intense quiet that sat between my mother and me on the phone, my husband swiftly finished his chores. He never looked up. He slid from Dolly’s stall, latched it thoughtfully, neatly stacked a couple feed buckets, peeled off his gloves and left them palm to palm four feet from me on the ledge by the barn door. He stepped out into the night and shut the stable door behind him, closing forever any mistaken air of intimacy between us. My mom was the first to speak. I cannot recall the first several words as they seemed to be lost in this fog of my mind; then followed a series of questions from my mom and limited answers from myself. The fog in my head began to part with every word I uttered out loud. No, I did not have a plan. No, I had no idea what stage of Cancer. No, I did not know how I got it. No, I did not know the prognosis. No, I had not even returned the nurse’s frantic calls. “This cannot be actually happening,” I murmured through the settling dust of barn’s dim light. I hung up the phone knowing two things: one, I already had a plan; and, two, this piece was not part of it. Photo by Flickr User grongar. I dragged the heels of my worn boots slowly across the old barn floor to the stable door. I looked back across the precisely piled hay, the rows of stacked grain buckets and neatly ordered tack. I exhaled at the straightforwardness of it all, then flipped off the lights and stepped from the order into a chaotic cold future I was sure I did not want. The night was icy and crisp and I felt it harden a part of my soul as I walked the 100 yard stretch between barn and house, alone. Alone, I walked into the house. Alone, I found my husband watching television. The pair of us sat together, yet oddly separate, and held the fragile space between the flashes from the television screen and the rush of words from his show. I did not interrupt. I could not ascertain the jumble of his possible feelings from my own. I sat on the edge of the couch and waited. There was so much to say. Miles seemed to stretch between us. How could I even begin to apologize for holding this horror back as a secret for me alone to bear? I needed to start with an “I am sorry for not sharing the horror that was insisting its way into our newly established life together,” but the words would not come. Before I could explain these or any of my feelings of fear that were strangling my ability to deal with the rational decisions that must be made towards my survival, before I could even take off my coat and find myself wrapped in his arms, he spoke. “I do not want to talk about this again. You’ll be fine.” With that, he snapped off the television and walked from the room. I heard him slip from his clothes and climb into bed. I sat there, in the dark, alone. I kept saying the words over and over again wondering if this kind, old doctor could really be telling me that at 21 years old I could die. No, my heart countered, I could not die. I had too many plans! How could I be sick? I remember cataloging the reasons why I could not be sick: I did not look sick, I did not feel sick, I did not act sick, I did not go to class every day like I was sick, I did not care for my horses like I was sick, I did not pedal my bike miles and miles a week like I was sick, I did not swim like I was sick, and I did not dream like I was sick. In fact, I was described by those who knew me as “with it,” “radiant,” “strong,” and “most likely to succeed.” Adding all of those things together, I continued to ask whether or not there could be a mistake. I mean, sure, I was tired, but what American girl working her way through college en route to medical school is not tired? The doctor remained stoic and painfully serious. He spouted off my condition, my prognosis, and my very uncreative treatment options as if he were ordering his usual sandwich for lunch. He wanted my pound of flesh: my ovaries, my uterus, my woman-ness OUT. Into the space left behind, he wanted to pump noxious chemicals and radiation. Following this plan, he stated coldly, I “should” be fine. If I was “lucky,” would not I have skated through all of life Cancer free? I was not lucky. I was angry. “Correct.” How he did not roll his eyes at the obvious question of a pre-med candidate, I will never know. Perhaps it was from delivering this news on a frequent basis and dealing with shock at similar repetition. Let me be clear: I never wanted kids. I had too many plans to want kids. A Peace Corp doctor does not have kids; she changes the world in other ways. I wanted to leave my mark in those ways. I wanted to travel and travel and travel and a child in tow would have compromised that freedom. So, I married a man who did not want kids. In the blueprint of my future, I had clearly, already, and completely ruled children out of the plan. So, why this? Why now? Why this unbelievable line of questioning crossing my brain, my heart, and my lips? Should I not hand them over my uterus and a thank you card for securing a “birth control free” future for me? In that moment, life got very hard. Everything I thought I had planned to the “T” came into question. Everything I was sure of just a month ago was now cataclysmically unsure. Do I just want what I cannot have? Am I just mourning the loss of my feminine powers with the loss of my womb? I questioned my soul. She did not answer. Perhaps she could not answer. I think she was as stunned as I. The plans I have spent an entire life dreaming into order shattered around me, within me and beneath me. I began to feel sick. I began to feel fear. Questions were growing inside me at the same rate as the tumor. “There are no other options. Miss. I am not here to negotiate your options. I am here to state your plan to optimize your survival.” He stared me down. I felt smaller and smaller with every breath I could not breathe. I scheduled the surgery only to cancel it from home hours later. I begrudgingly did some research and found another doctor. He was nice enough. He was gentle enough. But most importantly, he was creative enough to buy me some time with my uterus. He agreed to some options the other doctor had not offered. There were several marginal surgeries, not recommended, but potentially effective enough: take the tumor off and leave the uterus, and follow it with an aggressive chemotherapy, an experimental drug. I might end up sterile anyway, but at least it was a gamble of sorts. He even suggested that perhaps my boldness could save other women and their unborn children for years to come. He agreed to let me keep the uterus I was unsure I ever had any plans of using. Photo by Flickr User Peyman. It seemed as though the day after the first surgery, the rain came. I remember that spring being the grayest spring I had ever seen. It just would not stop. Every day was a more dismal shade of gray. Several rainy weeks and painful surgeries later, a shower drain full of the hair that was once on my head, and a growing intolerance for anything I once considered food, I began to feel my bitterness growing against each gray dawn that followed the night. Still, I got myself up and out of bed every morning and made myself choke down some toast and peppermint tea. I would sit and watch television and cry until I had to head into the clinic for a treatment or go make a feeble attempt to sit through a class or two. I would cry for lives on television that seemed so simple. For every emotional situation that arose, every illness, every loss, the story seemed to wrap itself up thoughtfully in 30, 60, or 90 minutes. I longed to wake up from this dream and find out my life was really a sitcom and I had just missed some lines. I cried for hours throughout the morning. I cried for the pain in my body, the loneliness in my heart, and the seemingly cold silence in my soul. I cried for the marriage that was slowly dissolving itself into memory, as he avoided me and I avoided me. There was less and less “we” to even avoid. I cried for the energy I used to feel driving me in the direction of my dreams. I wondered if I would cry forever. 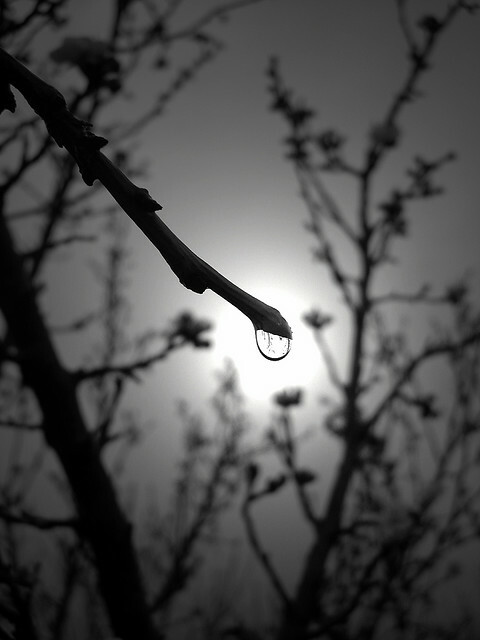 At the end of that rainy, tear-stained spring, I found myself sitting like a shadow in the doctor’s office; nauseated and limp, I awaited my fate. “Well, it is not working. Our options have ceased to present themselves as viable. We need to schedule a full hysterectomy and follow with a course of radiation.” The doctor stated this as he filtered through some papers on his desk. He did not even look at me while he delivered the news. I felt like an after-thought’s after-thought. Vomit boiled up inside of me. The foul volume of anger, fear, and frustration rose within my being and then angrily found its way out of my system, spraying across his desk, his papers, and his plans. “You’re fired,” I spat. The nurse fought back laughter, as she collected me and my things to steady me on my way out the door. She walked me to the ladies’ room and cleaned me up. She stayed with me and held me while I cried and cried and cried. Upon leaving that office for the last time, I felt a surge of desperation flow through me. I needed my mommy. Upon returning home, urgently wanting connection with her, I returned to the scene of the crime. I walked into the barn and called her. It was not a completely random statement. My minor was in Roman art and archeology. Perhaps she was trying to get me to a place of inspiration so that I would continue to fight. Further, my mother was a former Catholic and was perhaps turning towards a God she once felt as a strong presence in her life. Granted, she was kicked out of the Church over 20 years prior for divorcing a man who refused to uphold the sanctity of their marriage. Maybe she wanted to pick that bone in person and knew that I would gladly go to battle for her. Or, perhaps, the desperation to try anything to save her daughter’s life was softening her anger at God and the Church. The next several weeks were a blur of preparations and growing excitement. It was the first time I had felt inspired in months. Though the chemo’s nauseating effects were still prominent in my system, I packed, I planned again, and I hoped. My mother’s growing faith and generosity held me in my fragile state. She drained her savings along with her fear in the hope that this Pope could work a miracle. I saw her step from fear into belief as we walked from the plane into a power space of antiquity. Perhaps my mother was right. Perhaps a holy place could bring about a miracle. Perhaps I would be healed. We toured Rome for 10 days. We saw into every corner of the place. We saw every sight and statue and column. We laughed and ate pizza and sipped wine in amazing alley restaurants we could not find the next day. Wednesday finally came and we loaded ourselves onto a bus for the Vatican. Wednesday is the day that the Pope blesses the world. I was thrilled to learn that if you are a devoted Catholic, the world starts over at noon on Wednesdays. We walked across black obsidian cobblestones. We gazed up at all of the looming statues that lined the buildings binding Saint Peter’s square, with eyes wide in disbelief at the magnitude of beauty around us. The square is enormous and can hold tens of thousands of people. One building had a long red banner hanging down from a window that clearly indicated that this would be the spot from which the Pope would address those gathered. Photo by Flickr User Rubber Dragon. “Where do you want to stand?” My mother asked me. I looked around at the entire square and the sheer number of buses pouring people into the space. My eyes fell upon a group of young Polish nuns who were clearly giddy with excitement at seeing the pope. I guess the Pope to them is like Sting to me. They were abuzz with the anticipation of fans at a rock concert. I expected them to light candles and do the wave. “There! If he is going to see anyone, he will see them!” I grabbed my mother’s hand and we walked towards them. We set up our little camp and waited. The sun began to heat the marble beneath our feet and the people began to fill in all the spaces that were once air around us. Noon struck. The Pope came to the window and waived. He spoke and blessed in nine different languages. When he spoke in Polish, he acknowledged the women to our left and they went crazy, jumping up and down and waving at him. He spoke of love and peace and kindness. He spoke for about an hour and then made his farewells and slid from the window back inside. It was over. She was not worried about the heat, she was inquiring into how one feels when one has been bestowed the grace of divine, miraculous healing. I did not feel any different. I felt the same. Apparently nothing happened. Photo by Flickr User Valerie Everett. Her strength of newly reclaimed faith was about to be shattered, when the world around me began to spin. The world within me began to spin. I grew dizzy from my feet to my face. I crumbled beneath myself and headed to the earth. My fall was stopped by an older nun. She knelt on the ground with me and held me across her lap as my mother scrambled towards me with her water bottle. I was half in and half out of the world. The nun smiled gently, stared into my eyes with hers, glowing with compassion. “Dobra,” she spoke as she traced the sign of the cross on my forehead. 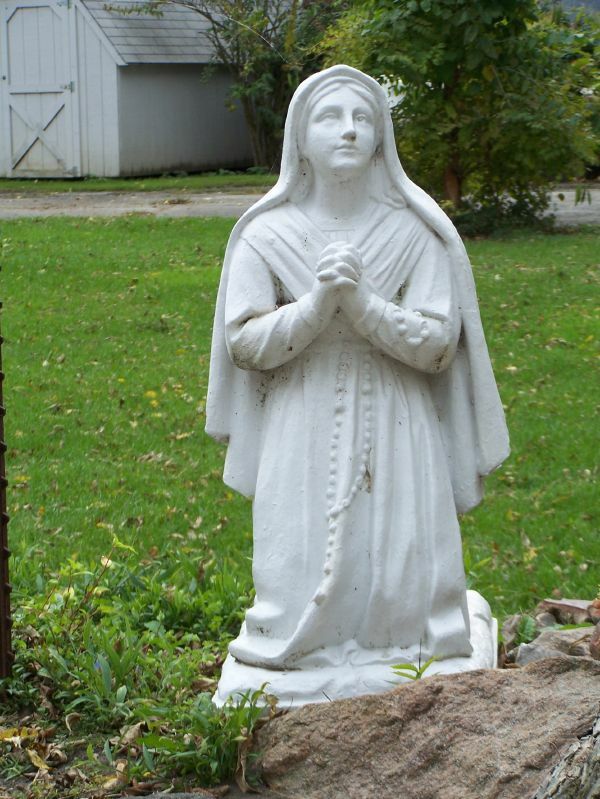 She passed me thoughtfully over to my kneeling and sobbing mother who held me close to her. In an instant, the flurry of people exiting the square and the heat swelled around us. Several young nuns helped walk us toward our bus, steadying me on my legs. My mother and I looked and looked around and could not see the older woman who had caught me from my fall. She had vanished. Sitting on the bus, sipping water, my mother spoke, “Dobra means ‘good’ in Polish.” How interesting that my mother, though a woman of Polish descent, knows very few Polish words. But she knew this one. “Good.” I wondered what she meant. I did not feel good. I did not look good. The situation of collapsing in a crowd is not generally a good thing. What did she mean? We flew home a few short days later. Once home, I cracked deeper into myself and continued to feel more and more withdrawn. The energy of answering the basic “How are you” and watching a person’s face fall when I answered them honestly took its toll in such a way that I initially started lying. I would respond with a quick “Great, really feeling on the mend,” “stronger every day,” “the chemo is working!” You believe they want these words. You believe that cancer should not have them as a victim too. They take these words and smile and with pity, look past your swollen eyes and do not believe a word of it. After a while, you feel as though the lies are not serving them. So you stop answering the phone. Eventually, those closest to you stop asking and start holding your hand, silently screaming for help from a God they simultaneously question for his cruelty. The larger part of me wanted to scream “BULLSH*T” at the top of my lungs and point out the injustice they had been dealt. The smaller part of me hid in the back, cried, and was unwilling to engage in conversation. I returned to the group only a handful of times more. The smaller part of me was stronger. I contemplated for hours how these people could cheerlead for Cancer in their lives. Cancer shattered my sense of self. Cancer shattered the “me” I knew so clearly and the “me” I knew I wanted to become. Cancer was even challenging the child I never knew I might somehow possibly want. I recounted this in the initial meeting I had with the new Grandma-type, Birkenstock-wearing, Boulder oncologist that agreed to take my case. I believe that this goddess, with a flowing gray mane, saved my life in this first meeting. She saved my life not by pulling out a vile of magic potion locked up in her top drawer, reserved for only the most depressed and pitiful of cancer patients. Instead, she saved my life with her ears. She listened to me. I flipped through the fat file she slid in front of me and marveled at how many brochures for saving the world this woman had collected. I was drawn to an organization’s pamphlet that had a child on a horse, grinning ear to ear, with the horse led by two proud adults on either side. The organization was local and it focused on teaching children with disabilities how to horseback ride. By learning to ride, these children connected deeper into a joy of self and an integration of mind, body, and spirit not previously available to them. “Those kids will change your life,” she said as she observed me reading the inside of the colorful flyer. I looked up meekly and smiled weakly. She walked me to the door and handed me a card and a schedule to a local yoga studio. The business card was for a surgeon, “just in case.” She was direct, but not too direct. I liked her. I found myself awake the next morning at least hopeful that the heaviness of the depression would be absent. No such luck. I found the gray weight of fear and anger and sadness still intact. I made a deal with myself to call the organization for which I would be volunteering and schedule my orientation. I further made a deal with myself to check out this recommended yoga thing. Over my tea, I perused the yoga class schedule and list of class descriptions. I have always been very athletically inclined. I played sports as child, I took dance and gymnastics in school, rode horses my whole life and raced my bike as an adult, so when looking at a yoga schedule, I passed right over the “beginning” classes and the “level one” classes and headed straight to the “level two” and “intermediate” offerings. How hard could they be, right? I dragged myself into the car and headed to the studio. Once there and in the door, I noticed that people were all filing into the studio around me carrying their own mats. I did not have a mat. I saw this immediately as a great reason to go home, right? The instructor saw me and offered me hers. She helped me get signed in and placed my mat on the floor. She gave a brief introduction with a philosophical flare about the ending really being the beginning and a connection of all things to all things. She then instructed us to lie down on our mats and close our eyes. I felt a wave of connectivity and relaxation roll over and through me and I fell instantly and deeply asleep. I awoke to a rhythmic collection of thuds and looked around to some gentle smiles. 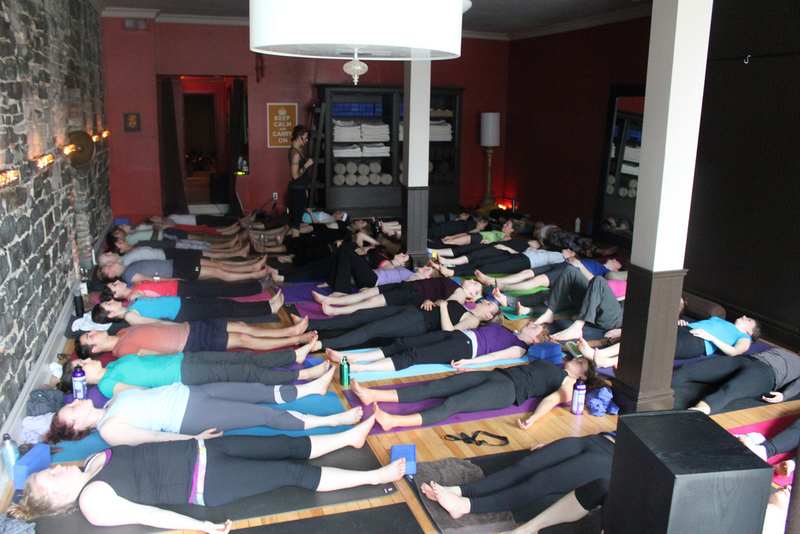 Everyone was flowing one posture to the next on their mats in a fluid precise dance of arms, legs, and breath. I scrambled to my feet and attempted to follow along. Easy, it was not. The postures were complex and the postures linked one to the next were so difficult to coordinate to the breath. I was exhausted as we lay down again for the final resting pose, although I made a deal with myself to stay awake this time. This rest was inspiring; I felt the moving of my cells inside in concert, doing their jobs with vibrancy and grace. I had not felt vibrant and graceful in months and months. Emerging from the rest posture many moments later, I acknowledged that I felt refreshed. I walked from the studio straight on a search to buy my own yoga mat. Photo by Flickr User tiffany assman. Every day I went to yoga and people began to smile at me. I began to smile back. No one smiled past my eyes with pity. Here I was regarded as well rather than sick. Here I was becoming more and more well. Sickness was becoming a memory. I enjoyed seeing my new doctor for tests and follow ups and discussions. I enjoyed telling her about my volunteer work walking the horses while the children with autism rode and thrived. I enjoyed telling her about my first yoga class when I arrived to a level two class prepared to be bored out of my skull and was instead challenged beyond belief! I realized that her prescription was beginning to work, I was beginning to “enjoy” again. Her smile at the end of my tales gently turned into the most compassionate pause in time. I knew something was about to be said that was not what I wanted to hear. However, I felt strangely prepared. I felt strangely centered. I felt my soul reach forward and hold my hand. “It appears as though the Cancer is fairly determined. Let’s talk.” She did not drop her eyes from mine. I nodded and held her gaze. We talked for a long time about the effects of the surgery and what our limited options were for removing the uterus given the nature of the Cancer’s return. We spoke at length about the options of this drug over that drug and what radiation might feel like. At the close of the meeting, we had woven a plan. From the back of my day planner, I drew the card of the surgeon she had handed me, “just in case.” This man was now the one who would hold the delicacy of our newly woven plan. I felt ready to trust. I sat before his desk the following afternoon. Nice desk. I made a mental note to myself to not throw up on it. I saw many smiling faces of women and children shining back at me from the numerous pictures he had adorning the walls of his office. Interesting, I thought to myself, this is where I remember degrees and accolades had been posted for other doctors; he was clearly inspiring a different type of confidence. He stepped into the office and I melted my gaze from the photos slightly embarrassed as if I may have been invading his doctoral privacy. He just smiled at me in the same steadiness that the women and children in the photos smiled at us both. I felt held in a collective smile. He was young. He was very young. He wore a CU sweatshirt and scrubs and carried an enormous latte. He did not sit behind the desk across from me, but rather sat on the edge of the desk immediately in front of me. We talked easily about many things: school, my hopes, my dreams, and finally my fears. “What are you really afraid of?” He asked me this in response to the laundry list of fears I had just shared with him. From this, we talked about kids and possible adoption and my volunteer work at the riding center. He was right, if I really loved children and it really was my calling, I would find a way. A uterus, does not a mother make. We talked about yoga and this growing connection I was feeling between my heart, my mind, and my body. As we talked, I began to merge my past forward into my future. I felt suspended on the fabric of NOW and I began to want to live in a space of not knowing. I began to feel the nameless fear fall silent into the pencil thin shadows cast by the light of this revelation. I began to breathe a deeper breath. I left his office with a surgery scheduled as an appointment I would keep. I sat in the car in his parking lot and thought and thought. I think I sat for hours. I thought about the person I was before the diagnosis, the person I became through the process of fighting the disease, and the person I could choose to become once I became committed to participating in my own survival. The bitterness melted, as the heat of the sunshine warmed the car and my awareness warmed my heart. I drove to my yoga class and began to move. I creatively moved between one pose and the next as the breath led the way. A sense of calm rolled through me as the next breath came and the next and the next. I have been Cancer free now for years and years. I left the pre-med track and began wholeheartedly to study yoga, comparative religions and their art and I find myself studying still. I delved from yoga teacher training to yoga teacher training and I continue to practice, study, and teach every day. I feel blessed to have met some of the most amazing life explorers on a completely different path than I ever thought I would walk. I felt the strength to say goodbye to one marriage and hello to another. The man I drew into my heart is a man whom I love every day as hard as I can. I have no idea what tomorrow will hold, but today is pretty incredible. A couple of years ago, my sweet husband and I sat together, hand in hand, on our yoga studio floor before our philosophy teacher and the topic of miracles arose. My ears perked up at the sheer mention of miracles and the questioning of miracles. 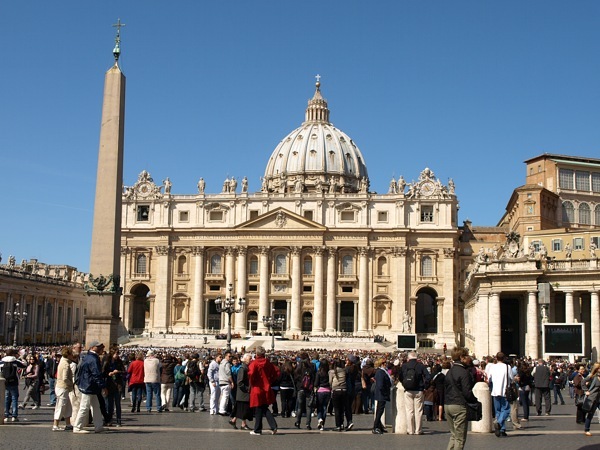 What did happen to me in the square of Saint Peter? My mother found her faith strongly that day. She was as certain as the day is long that there was an unseen force that knew to plop a nun, or an angel, right next to me to catch me as I fell and remind me of my intrinsic goodness. She believed in a miracle that resulted in the word “remission” upon my return to the United States. I wondered. No one was ever able to tell me what plunged me into remission when the doctor was so convinced he could hear my death rattle before I decorated his desk with my breakfast. Was it luck that I am still alive? Was I really just lucky? Similarly, after meeting the most compassionate doctor that set me on the path to self-love and wellness, no one could ever tell me why I started to come out of remission. Was it luck? Was I really just lucky? I wondered. If the nun was luck, or rather a miracle, do miracles have time limits? And if so, when will mine expire? Did I do something to unseat luck or piss it off to initially get cancer? What would happen if there were no certainties in the world at all and every time you lit a match, it was not fire you got, but a random miracle: sometimes fire, sometimes rain, sometimes bananas, sometimes monkeys, and sometimes glue. I bet we would eventually stop lighting matches. I wondered. Perhaps there is no plan, no design, just luck. However, the wondering in me no longer raised fear, but rather an ever more interesting level of faith. I did not know. I found that I was strangely comforted by not knowing, but instead believing in the good and feeling a warming to effort in the direction of the good. That I ever got Cancer in the first place was certainly not good luck. I could not praise it; what an awful and terrible disease. However, it radically changed the direction of my life. Cancer made me want to quit and lie down and melt into the memory of my dreams. It shook me off my plan and opened me to the possibilities of more than one plan. It opened me to the creative evolution of the revolution of all of the time I might have on this planet. In that moment, on that studio floor, an epiphany was born to me that drew my life deeper into itself: today, I have the lucky. Life is a creative and organic dance of “The Lucky.” I am so blessed. I have one more day. I have the ability to love as hard as I can and direct my life in the direction of my dreams, as long as I do not give up. I have no idea what may happen to me and those I love as time flows through itself; however, I am not afraid. It was not a child that I needed to bear, it was not a doctor that I needed to become, it was a life purpose that was fighting its way from the source of me to the surface. A love of life bubbled from inside of me into experience and into existence. Life, through me, wanted to prove how strongly it desires to live. I am grateful. I am engaged in the daily experience even more so than before. Perhaps through the lives I now touch, I can inspire this insight. Today, now, I have the lucky. Living fully as an author, sacred activist, motivational speaker, dedicated teacher of Shiva Rea’s Prana Flow, and founder of Anjali Restorative Yoga; Shannon Paige is an expressive student of the symbolic nature of Tantra and mystic poetry. She interweaves her student’s unique purpose driven inspiration into the divine play of body and breath to unlock the secret wisdom held within the heart. Her classes are dedicated to a sense of mystery and wonder within a vinyasa of self-honoring, self-cultivation, and radical self-participation. Shannon is the founder and director of om time yoga centers, tours, teaches and speaks nationally and internationally. Shannon can be found here on Facebookand on Twitter at @shrishrishri. Bio photo by Rick Cummings, RickPhoto.com. This entry was posted in Emotional Healing, Physical Healing, Spirituality and tagged cancer, healing, illness, inspiration, life, Shannon Paige Schneider, spirituality, The Yoga Diaries, transformation, yoga by The Yoga Diaries. Bookmark the permalink. Incredible story of challenge & redirection. So glad you found the wise woman doc! Thanks for taking the time to so thoughtfully articulate your story, Shannon. I was diagnosed with cervical cancer in my 20’s as well. Although I was “lucky” enough to have it eradicated by an overnight surgical procedure, it shifted my perspective in ways similar to those you described, and ironically enough, I am a yoga teacher and studio owner now too. I spend a lot of time contemplating whether these sorts of events are completely random – lila – or if they are somehow products of our interaction with the flow and thus are interruptions that gently (or violently) guide us back into the current where we better serve ourselves and our communities. Depending on the day I might believe wholeheartedly in “the lucky” or 100% in the alignment of events to help me down a better path. I just don’t know. I do know that when I am happy about where I am and what I am doing, it doesn’t matter that much. Just as you describe, the not knowing can be oddly comfortable and curious. I love your phrase “life, through me, wanted to prove how strongly it desires to live.” Maybe that is the key. Gratitude for writing, and best wishes on the journey. Astoundingly beautiful. Thank you for sharing you write exquisitely. When will your first book be coming out!?? Namaste, Milijana ~ girl skirt mission (we met at Yoga Journal Conference quite a few years ago. This is so beautiful. I have cried and smiled through this story. I appreciate you so much for sharing. I read this and just collapsed on my couch in sobbing hysterics. Tears of gratitude and tears of fear, selfish tears and tears filled with generosity and joy.